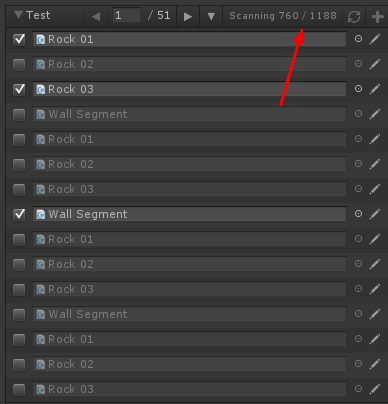 Using Unity 5.5.0f3, the Unity editor freezes immediately when inspecting a component using the Odin Inspector asset list. We have so far been unable to replicate this issue in any way. Could you give further details on the code required to provoke the freeze, and which version of Odin you were using at the time? Sure, we're using Odin 9.03, and this freeze happens in the 'odin attributes overview' when selecting the 'asset list' object. I have an asset list inside a tab - when I try to open the tab, Unity freezes for about 30 seconds , before eventually switching tab and showing me the asset list. We have concluded that asset list initialization, where-in the project's assets are scanned for inclusion in the asset list, is taking up a lot of time in large projects with a lot of assets, causing the inspector to freeze for an unacceptable period of time. We believe this is the issue both of you are experiencing. We are working on letting the asset list update over time, letting it populate itself gradually in large projects, so that work in the inspector can be continued while the asset list initializes itself. The Asset List now updates over time. It should also be much faster at finding the relevant assets, what took me multiple seconds before now takes less than a second. The main problem is happening when we are scanning the entire project for prefabs which contains a specific component. Unity doesn't provide any fast way of doing this as far as I know. So right now we are loading all prefabs (AssetDatabase.LoadAssetAtPath<GameObject>(prefabPath)), and checking to see if it has the component we are looking for. But now this at least happens over time, and you can use the GUI in the meantime. Awesome! What version will this be in? The next one ! We'll update you all very soon with a new beta version (0.9.0.5) - which will properly, be the last beta version before release. The next beta version will btw also contain support for drawing dictionaries in the Inspector.